As one of just a handful of colleges across the country offering interprofessional healthcare education, D’Youville is a leader in preparing its students to be the best professionals in their fields. The interdisciplinary Interprofessional (IPE) Simulation Lab is a learning experience for students majoring in eight healthcare professions at D’Youville. It prepares students to work as part of a collaborative healthcare team — in a safe, simulated clinical setting, with skilled actors playing patients. 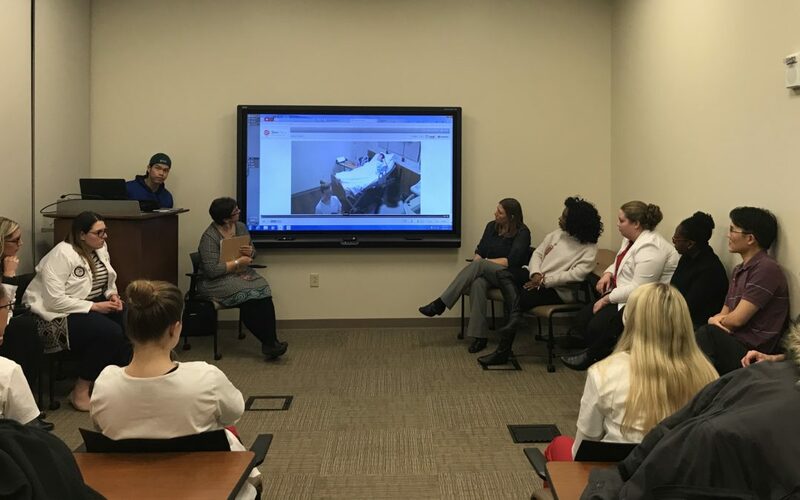 Sessions are live-streamed to the group, so students can view interaction with the patient, debrief as a group and share insights from different clinical perspectives. Discussions focus on building the kind of teamwork that a healthcare professional actually encounters on a regular basis. On February 6, I got to see the “CHRIS DULLES” IPE Simulation in action at the Catholic Health Regional Training Center downtown. Expert instructors, Karen Mlodozeniec and Donna Brzykcy started the session with an ice breaker. Students across disciplines had a chance to meet the student learner seated next to them. Then, students were called in pairs and teams to interact with the patient actors in another room. Not only did students not know exactly what they would encounter, they also hadn’t previously interacted with the other students whom they were paired. Scenario by scenario, we tuned in via the Livestream and listened in as students interacted with the patients and each other. In the first scenario, a nursing student and a physical therapy student took turns getting the rhythm of asking the patient different questions that could provide them each with answers about his back pain (not pains). In another scenario, two nursing students evaluated a patient while another actor, playing the patient’s wife, provided ample distraction. Two physician assistant students then came in and listened as the nurses relayed their findings. The debriefing session after each scenario gave students a chance to reflect on the situations, point out what students did well, and discuss health professionals’ roles and scope of practice. This is the kind of interdisciplinary work all of our students can expect to see in their careers – working with people across disciplines, interests, and expertise. Simulations and interdisciplinary experiences, such as IPE, give students a chance to apply their knowledge, interact with others, and gain confidence in what they know. It is a truly unique learning experience that every student should be fortunate enough to experience in their college career. We are fortunate that the dedicated faculty here at the College make it happen.